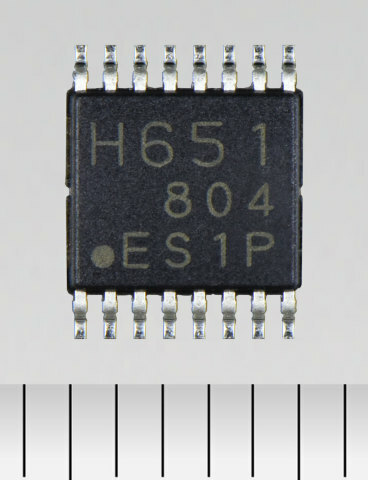 Toshiba Electronic Devices & Storage Corporation today announced the launch of "TC78H651FNG,” a dual-H-bridge driver IC for DC brushed motors and stepping motors that delivers the low voltage (1.8V) and high current (1.6A) essential for low voltage equipment powered by dry-cell batteries, such as mobile devices, electronic products for the home and USB drives. Sample shipments start today. This trend is stimulating demand for driver ICs capable of driving devices even at the low voltage of 1.8V (0.9V × 2 batteries, whose capacity is reduced by discharge though 1.5V, 1.2V, etc. are initial voltages.). Toshiba’s new dual-H-bridge driver IC uses Toshiba’s specialized DMOS process for low voltage drives to achieve a longer battery life with a stable low voltage operation. Improved motor torque is also realized by reducing IC losses through low on-resistance . The new product is suitable for motor applications driven by relatively low voltage batteries (1.8V to 6.0V). (3) Error detection functions for over current protection, thermal shutdown, and under voltage lockout contribute to device safety. Motor applications driven by relatively low voltage batteries (1.8V to 6.0V), mobile devices (cameras and compact printers) using 3.7V lithium-ion batteries, products for the home, such as gas stoves, smart meters, and electronic locks, toys using two 1.5V dry batteries, and devices using 5V USB power supply. Used to control forward and reverse rotation for DC brushed motors and stepping motors. Transistors and loads have an H-shaped configuration. Actual motor current is limited by operating conditions, such as ambient temperature and supply voltage. Resistive component when current flows. The lower resistance value achieves a lower loss in motor drives and suppresses heat generation.